An independent test has shown that a Vesconite left-hand torque-plate bushing, made from a no-grease hard-wearing engineered polymer, shows 35% less wear than a phosphor bronze right-hand torque-plate bushing of a similar design after one year of being exposed to abrasive material. The test was carried out by a large trailer manufacturer over one year, and utilised a vibrating jig on which the bronze bushing was mounted on one side and the Vesconite one mounted on the other side. The jig was enclosed in plastic wrap and sand and an inflow of air was introduced through a hole to simulate the abrasive off-road material that the bushings would be exposed to. No seals were used so that the bushings would be maximally exposed to abrasive wear conditions. “The intention was to mimic how a truck drove and when it braked to emulate the expansion against the drum,” says the test engineer. The results were conclusive: the Vesconite bushing showed 0.0175mm of wear to its inside diameter after one year compared to 0.05mm wear for phosphor bronze – demonstrating that a phosphor bronze bushing has 35% faster wear than Vesconite in a dry application with sand and under laboratory conditions. Similarly, when shaft wear was considered, Vesconite shaft wear totalled 0.0025mm after a year, while the comparable phosphor bronze bushing showed wear of 0.0125mm. Considering bushing wear and shaft wear, the Vesconite showed an increase in clearance of 0.02mm, while the phosphor bronze had an increase in clearance of 0.0625mm over the same period. 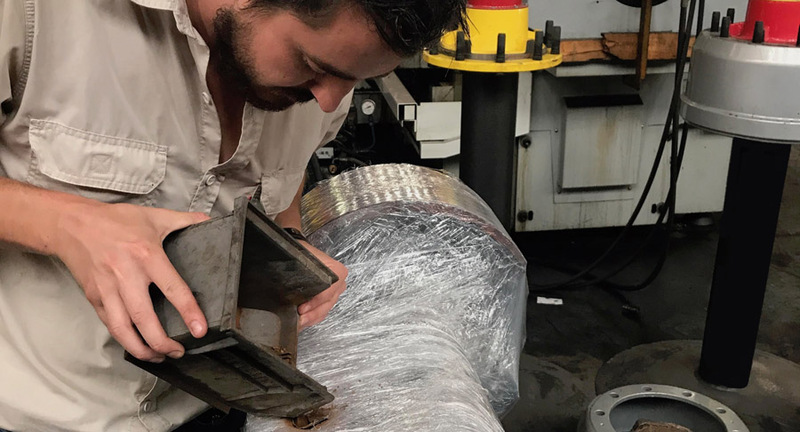 “One would expect that the wear rates would get worse in the second year and even worse in the third year,” advises Vesconite Bearings technical sales representative Eddie Swanepoel. “In addition, in tough off-road conditions where the bushings are exposed to impact, there is likely to be much more wear than in a laboratory test environment,” he says, noting that one coal transporter has had to replace his phosphor bronze bushings four times a year, compared to once a year with Vesconite. Swanepoel points out that, while the bushing wear measurements seem small, these small changes in bushing sizing and shaft wear result in significant impacts for associated components, including tyres, which would be affected by poor alignment. Fuel costs would also increase if wheel alignment was out, he adds. There would be similar cost implications if nylon bushings were used in preference to Vesconite ones, Swanepoel advises. The Vesconite self-aligning bushing showed far less wear than nylon self-aligning bushing, and there was also less wear to the shaft where the Vesconite bushing was used, he notes. In the trailer manufacturer’s study, the nylon bushing showed 0.1325mm of wear over the one year period compared to wear of 0.0075mm for the Vesconite. The same study showed shaft wear of 0.0125mm for nylon compared to 0.010mm of wear for the Vesconite bushing. Once again, Swanepoel advises that harsh off-road conditions would make the comparative differences more extreme and that it is likely that nylon would perform even worse in non-laboratory conditions. The impact on maintenance for associated equipment would also be more convincing, he says.